Special Offer: Buy the three-book nonprofit leadership set including Leading Out-of-the- Box Change, Building a Rock-Solid Partnership With Your Board, and Meeting the Governing Challenge together and receive a 25% discount. You’ll save more than $18 off the regular price. Use the Add to Cart button below to purchase all three books. 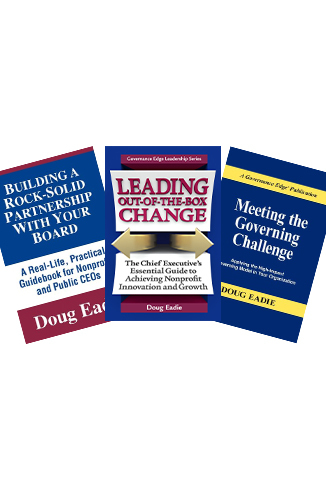 Drawing on Doug’s work with hundreds of nonprofit and public organizations, this three-book set offers a practical course in organizing and empowering a supportive governing board that will work closely with you to assure your organization’s long-term success. Lead the kind of out-of-the-box change that will turn your governing body into a strong advocate for, and owner of, important change initiatives—in the context of solid foundational values and a crystal-clear vision for the future. Buy enough copies for all of your senior staff and board members. President & CEO of Doug Eadie & Company, Inc., Doug Eadie assists superintendents in building rock-solid partnerships with their school boards.